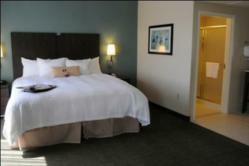 Hampton Inn & Suites Dartmouth Hotel is now offering High-Definition TV with over 120 channels in all guest rooms. We’re pleased to offer our guests over 120 channels, up from 42 channels previously available at our Dartmouth Suite Hotel. The Dartmouth Hotel Hampton Inn & Suites is pleased to announce the installation of High-Definition Television (HDTV) in all guest rooms. Guests of the Hampton Inn & Suites can now experience over 120 HD channels while staying at the Dartmouth eco-friendly hotel. HDTV refers to video having resolution substantially higher than traditional systems offering viewers the sharpest television picture available. With unparalleled picture clarity and rich, vibrant colors, via 1080i technology, HD television offers exceptional sound via the true cinematic experience of Dolby Digital 5.1 surround sound. HDTV is available on the 32” LCD televisions in all 163 guestrooms throughout the Dartmouth suite hotel. Guests of the Dartmouth Hotel can now look forward to retiring to their guest rooms after a busy day of conferences and meetings to enjoy the best in picture quality. In addition to complimentary HDTV, the Hampton Inn & Suites offers guests free parking, complimentary wi-fi and the signature On the House® breakfast buffet to all registered guests making business travel more affordable. The Dartmouth hotel has a convenient location for a Halifax meeting, just minutes away from the Halifax Stanfield International Airport and adjacent to Burnside Industrial Park, the largest business park in Atlantic Canada. With a complete Dartmouth Hotel Business Centre, spacious and diverse meeting space as well as competitive business rates, the Hampton Inn & Suites is the optimal location for Dartmouth meetings. The Hampton Inn & Suites’ modern amenities, complimentary services and convenient location combine to make a successful Halifax conference. For more information on the Dartmouth hotels services and amenities or to book a great Halifax hotel deal, visit http://www.dartmouthhampton.com. Connect personally with the Dartmouth hotel on their blog at http://www.dartmouthhampton.com/blog to learn about popular Dartmouth attractions and all about the latest things to do in Halifax, Nova Scotia. New Castle Hotels & Resorts own and/or manage 30 resorts and hotels in the United States and Canada. The hotel management company consistently ranks in the country’s top 100 hotel management and development companies in hospitality industry trade publications. For more information on New Castle Hotels and Resorts, please contact Gerald P. Chase, president and chief operating officer, at (203) 925-8370 or visit the corporate website at http://www.newcastlehotels.com.